If the eye is the aperture of the artist’s perceptions, the palette is the crucible for her expressions. The palette is the physical locus – only a square foot or so in surface area – where pigments, combined in complex ratios, acquire pictorial meaning. And like a crucible the palette serves as the unseen vehicle, rather than a component, of the final expression. Well, not always. Mari Lyons’ latest exhibition at First Street Gallery celebrates the artist’s palette by including images of it in nearly every one of her vividly abstracted studio scenes. These palettes – they appear as at least three types – don’t necessarily rest naturally among the other objects in the artist's paintings and pastels. While all participate in the give-and-take of the her heightened colors and fluid brushwork, some lean opaquely against a studio wall, while others float through space, often as semi- or fully transparent windows that frame – and sometimes color-tint – other objects. Lyons’ forms are usually recognizable, even as her luminous colors and flattened shapes push the bounds of representation. But a hovering oval palette in “Abstraction with Palette Forms” (2015) remains about the only identifiable form in this energized tumble of loops and crescents of pale yellow, cerulean blue and orange-reds, all set within a squared geometry of reddish-browns. More typical, though, is Lyons’ large canvas of an Ibibio sculpture (from south-eastern Nigeria) surrounded by other studio bric-a-brac. 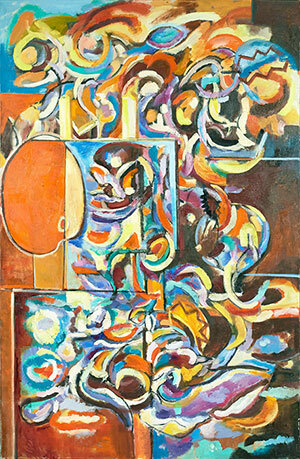 Though abstracted, the canvas is populated by emphatically real objects: a carved, violin-playing cherub on a small base; a pumpkin and a vase; an easel presenting another painting in progress. The rather wizened Ibibio figure rises as a tower of powerful articulations, its orangey-pinks buoyant against the blue-greens of background. Several palettes punctuate the proceedings, floating between the many other objects and, in one humorous instance, even taking its place among the depicted items in the in-progress canvas. The palettes participate in the disciplined depiction of forms, their rounding shapes animating the intervals between elements. But they also feel intensely free, liberated from the laws of gravity and perspective. It’s if they swooped in and settled before our eyes, as if to remind us that they are, after all, the originating point for the radiant energy of these paintings.